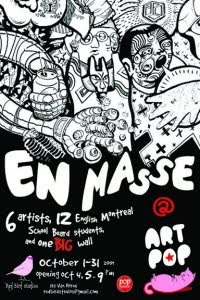 Today Sunday Oct 4 is the opening of a new En Masse collaboration giant drawing. This time I was part of only 6 artists(of the 30 in the gang) who made fun black n white drawings with 12 teenagers from underprivilaged high schools. It was fun, I love playing and creating with kids. Oh yeah, this is part of the Pop festival, so I feel very cool now.